Our Learning Center is operated by an all-volunteer staff and provides a friendly, pressure-free, environment for students to learn to use the computer and share experiences and knowledge. We provide hands-on instruction and detailed lesson plans. Our classroom is equipped with twelve computers with webcams, one scanner, a laser printer and a high quality ink jet printer. The computers are networked and connected to the internet via a high speed cable line. We have an instructor and at least one coach in each class session. SeniorNet’s mission . . . .
to provide older adults education for and access to computer technologies to enhance their lives and enable them to share their knowledge and wisdom. Find out how you can become a part of SeniorNet and start enjoying the benefits of membership today! 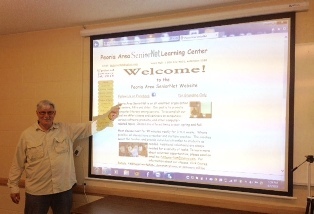 The Peoria Area SeniorNet Learning Center provides adults age 50 and older the opportunity to enhance their knowledge by offering a wide range of classes for computers, cameras, smart phones, tablets and other subjects. The Peoria Area SeniorNet is an all-volunteer organization of seniors, fifty and older. Our goal is to promote computer literacy among seniors. To accomplish our goal we offer classes and seminars on computers, tablets, smart phones, digital cameras, various software products, and other computer-related topics. Classes are offered twice a year, spring and fall. Most classes meet for 90 minutes weekly for 3 to 6 weeks. Where possible, all classes have a teacher and multiple coaches. The coaches assist the teacher and provide individual attention to students as needed. Additional volunteers are always needed for a variety of tasks. To learn more about volunteer opportunities, please send an email to: PASeniorNet@Yahoo.com. For information about our classes, click Classes. Additional workshops, demonstrations, or seminars will be listed on the Calendar-Events page. Check back periodically for updated information. We have no facilities of our own. We rely heavily on the generous support of our in-kind sponsors and community organizations that allow us to use their computer labs. We have held classes at many libraries, schools, and churches in the area. Any public place with a computer lab may request our services. In addition to our in-kind sponsors, The First Baptist Church of Peoria and SeniorNet National, we are sponsored and financially supported by Illinois Eye Center, The Senior Care Network of Peoria, Members Choice Credit Union and Health Alliance Medicare.